I’m not sure what it is about fall and winter that bring a variety of foods to our mind, but aren’t we all thinking about comforting casseroles, warm soups, and pumpkin everything? I thought I’d gather together some of my favorites in those categories and highlight them all in one post for you today! My recipe index here on my blog could be overwhelming, so maybe this list of a few favorites will help your October to be delicious! I’m not a mac and cheese fan, but this recipe is fabulous!!! I’d eat it every day if I could! Nutty Orange Coffee Cake – Perfect for breakfast or brunch! Butter Dips – Delicious with supper! Low-Fat Baking Powder Biscuits – Any time you need a biscuit – breakfast or supper! Butternut Squash Soup – I made this again last week. It’s heavenly! Oh, this cake!!!! Love it. Pumpkin Muffins – Great addition to breakfast or a fall supper! Pumpkin Roll Step by step instructions in my post! You can make this! Pumpkin Crunch Cake – Fast and incredible! Pumpkin Bread – Make small loaves to share. Pumpkin Scones with Berry Butter – Oh my goodness, these are fantastic!! If you’ll be hosting any fall event, having guests over, or cooking supper for your own family and want to try something new and delicious, here’s a great list to pull from! These are some of my favorite fall foods that are tried and true! If you need suggestions for other categories – salad, easy bread, breakfast, etc.) just leave a comment. I’ll be happy to help you! 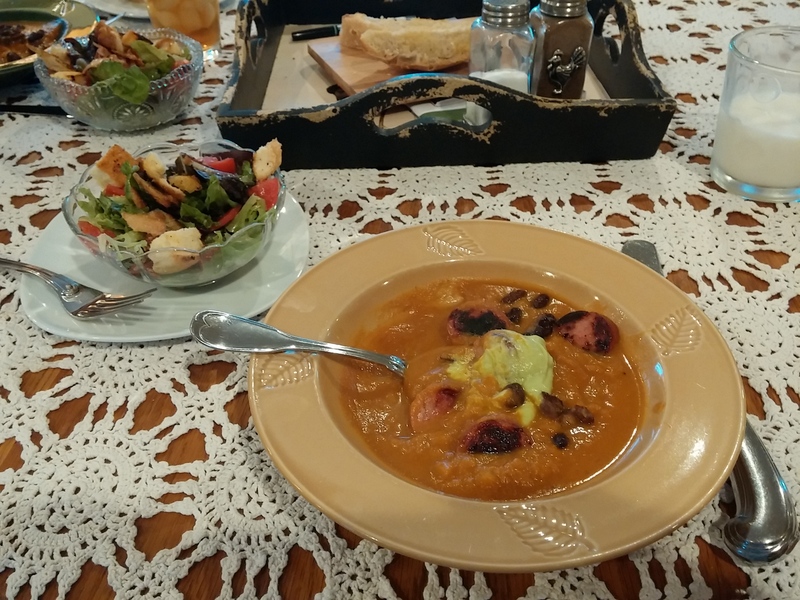 Spicy Pumpkin Soup – A Different Angle on Pumpkin Spice! I am not one who has jumped on the “Pumpkin Spice Everything” Bandwagon! I like pumpkin just fine in a few things, but I’m not even crazy about the PS Creamers that most are wild over. So, when I saw a recipe for Spicy Pumpkin Soup in the recent issue of Southern Living, I was quite skeptical. 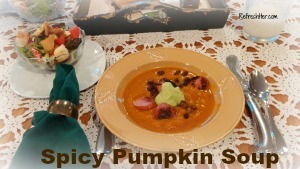 However, once I looked over the ingredients, I could tell that the pumpkin was not the main flavor in the soup. It has Chicken broth that smooths out the pumpkin flavor. And rather than the spices that make pumpkin pie, the spice added is the heat of a chili pepper and adobo sauce. The little bit of heat makes it perfect! It also has smoked sausage, which I love, and black beans added to it, to round it out. The result? A lovely, creamy, soup that doesn’t shout, Pumpkin spice at you! 3. Process avocado, next 3 ingredients, and remaining 1/2 tsp. salt in a blender until smooth. Add up to 1/4 cup water, 1 Tbsp. at a time, to reach desired consistency. I personally didn’t think the soup needed the avodaco sauce. It added no extra flavor – just a pretty dollop of color. I trusted Southern Living’s good reputation, and I’m glad I did! This was a nice supper and also made a delightful leftover for lunch the next day (I halved the recipe). You need to try this – even if you’re like me and don’t LOVE Pumpkin Spice. I would definitely make this again! Are you a Pumpkin Spice fan? If so, how do you enjoy it?